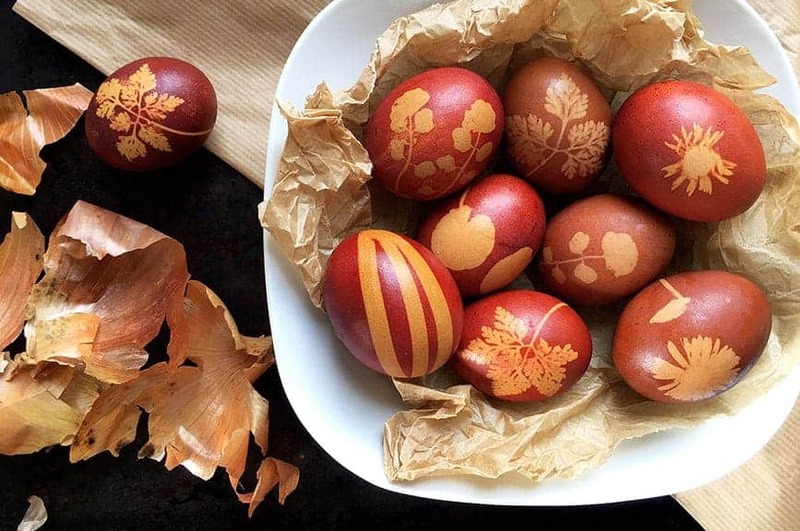 I’ve been using this method of decorating Easter eggs every year since I was a child. I learnt it from my granny and now I taught my children how to do it. 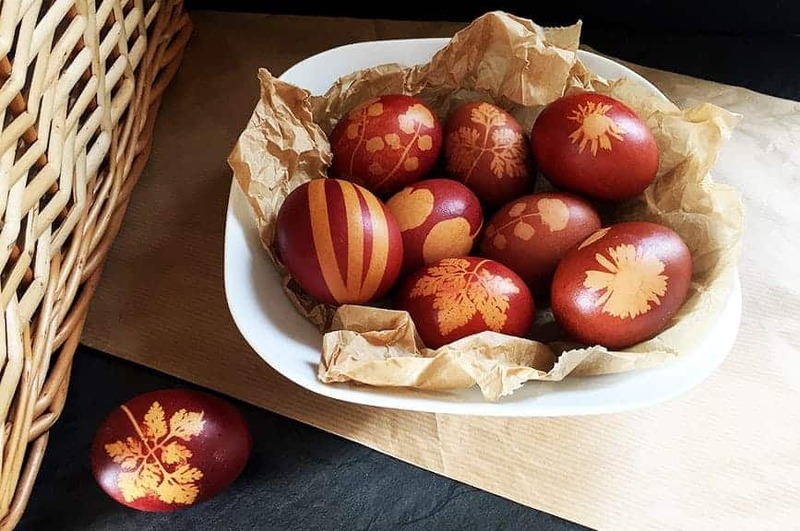 In Czechia where I’m originally from, only girls decorate eggs but I involved my two boys anyway as I think it’s so much fun when we do it together. 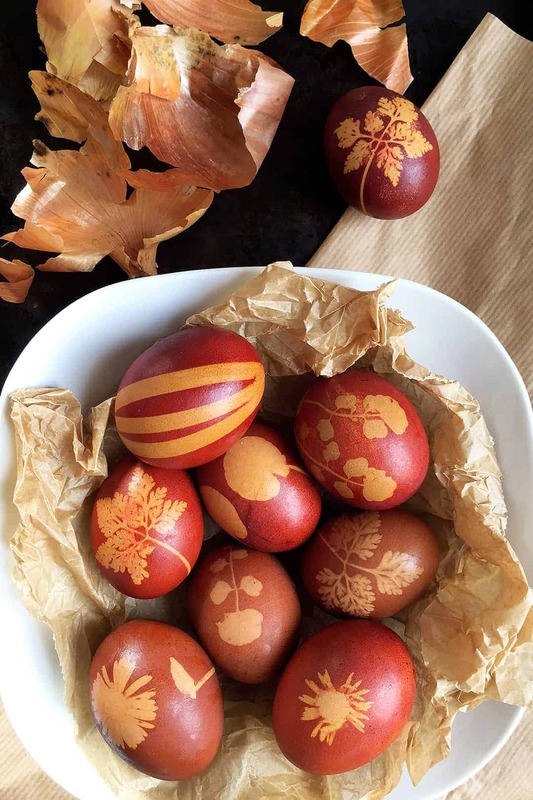 Every year we dye eggs in onion skin and decorate them with flowers or leaf prints and I am always stunned by the beautiful result. It is such a lovely way to welcome spring after a cold, grey winter. This method involves boiling eggs in onion skins which releases pigments that colour the eggshells. It’s the best to collect as much dry onion skins as possible in advance. 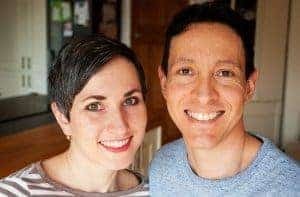 You can start collecting a couple of months before Easter. You can also ask in the shops where they sell loose onion as they might have some dry onion peels. More onion skins = darker eggs. Just before you start decorating pick some small spring flowers and leaves from the garden. 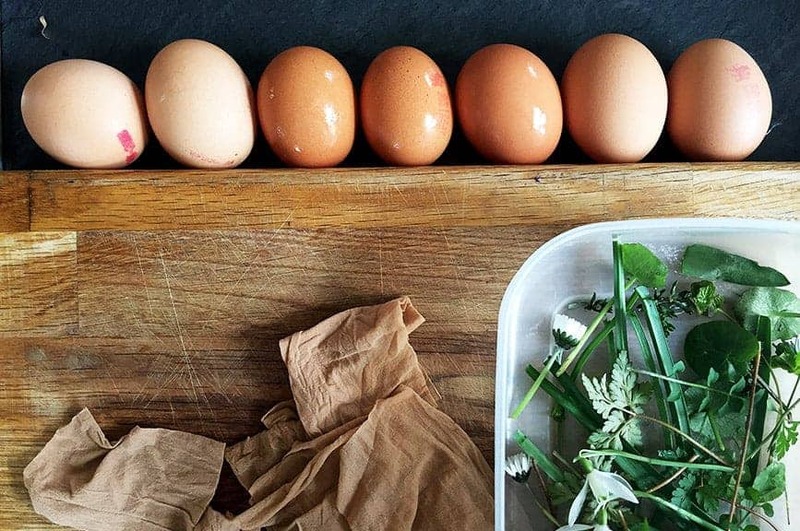 Clean all eggs with vinegar to get rid of all oil and dirt. 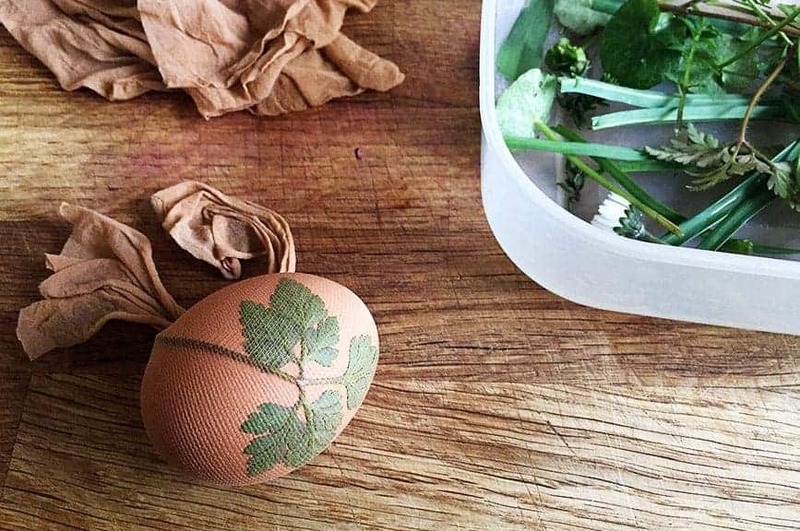 Lay the strip of cut tights down, position the leaf in the middle and put the egg on top of the leaf. Wrap the strip of tights around the egg and carefully tighten the ends at the top. The knot should be fastened properly so the leaf is held tightly against the egg and water can’t get under it. It is a bit fiddly, but you will get there after some trial and error. Cover the bottom of a wide pot with 1/2 of the onion skins and carefully put the wrapped eggs in. Cover the eggs with the remaining onion skins. I can generally pack 4 handfuls of dry onion skins and 8 – 10 eggs into a pot 25 cm in diameter. Fill the pot with water so all eggs are completely covered and slowly bring them to boil. Once the water starts boiling leave the temperature on medium heat and cook for 15 – 20 minutes. This should be enough time for the pigment from the onion skin to dye the eggshells. 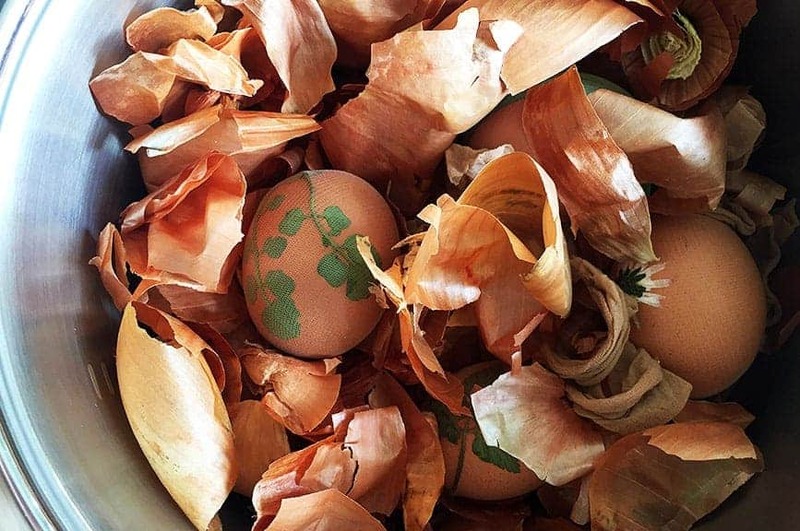 Once cooked, remove the eggs from the pot and place them on to an old newspaper as they will otherwise stain your countertop. Carefully remove the old tights and the leaf to uncover the picture underneath. You have to work quickly while the eggs are still very hot to be able to remove the leaf. 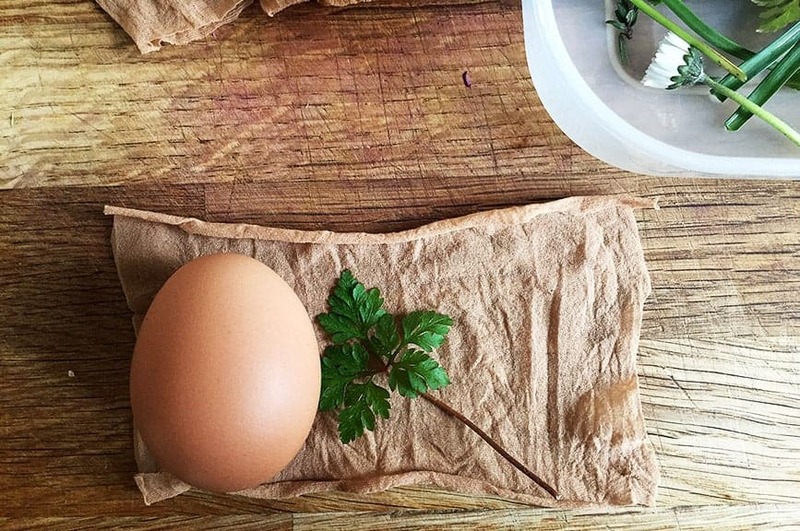 If you wait for the eggs to cool down, the leaf may dry onto the eggshell and you won’t be able to remove it. Unfortunately, rubbing them off will scratch the colour off. The very last step is to make eggs shiny as they become dull once they dry out. Coating them with the lard or oil gives them a nice shine and makes their colours more vibrant. Note: Don’t eat the eggs if you leave them in the room temperature out of the fridge most of the day. It’s recommended to discard all eggs that were left in the room temperature for more than 2 hours so if you know you want to eat them make sure you put them to the fridge in time. 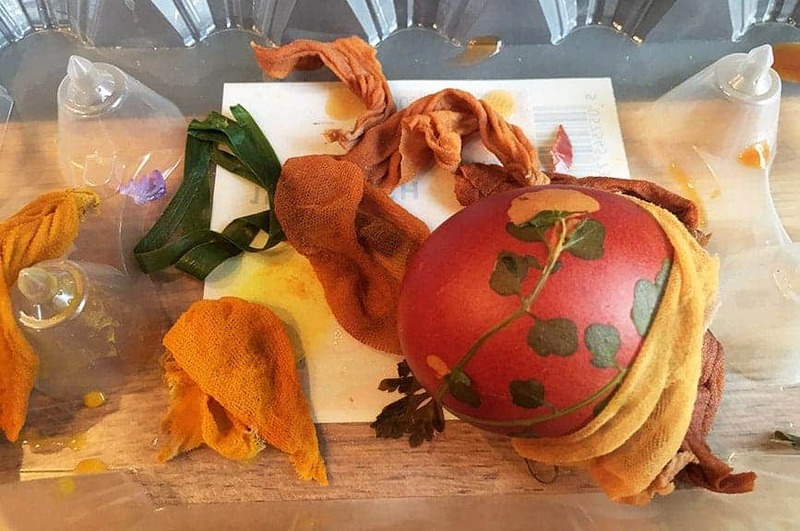 If you are interested in finding how to dye eggs naturally with turmeric, cabbage and tea look at my other Easter post.